This past weekend, I attended the Black Muslim Psychology Conference founded by a stalwart of the Philadelphia Muslim community and someone I consider a friend Kameelah Rashad. The Black Muslim Psychology Conference started out as an idea that Kameelah developed, spurred from the pain of the continual murder of unarmed and innocent Black Men and Women by the hands of those sworn to protect and serve. She knew that the community needed hope and love and community and psychological healing. What better way to do that than a conference for us, by us. Honestly, I don't know what I was expecting from BMPC but I do know that while words usually come easy to me, putting my experience this weekend to pen was extremely hard. There are so many emotions that I experienced from sadness, to pain, love, awe, despair, gratitude, motivation, and finally but most important, hope. Only a space that has been expressly created for Black Muslim people could do this. Setting the pace of day one was the conviction and excellence that was Ilhan Omar, the newly elected Minnesota State Representative for District 60B whose keynote address helped to welcome us to the conference. Then there was the seemingly endless supply of fruit, pastries (fitting since Kameelah also used to own a bakery) coffee and tea. 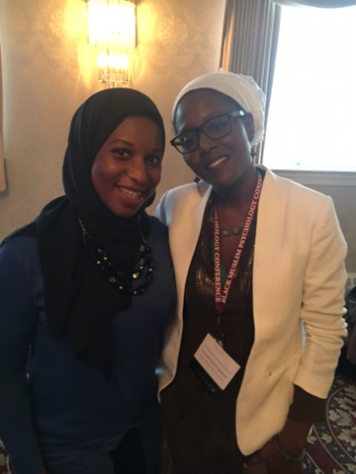 Then there was the people I'd been friends with on FB for years that I was now able to meet in person like Khadijah Abdullah, and of course the beautiful ambiance of The Presidential. Speaking of the venue, it was secured in less than a month before the conference after the waiting list grew to over 100 people and the old venue, The Sugarloaf Hill had to be abandoned. So now's as good a time as any to ask that you help BMPC offset this cost by donating here https://www.youcaring.com/muslimwellnessfoundation-852118! What also stood out to me was the attendance of a significant portion of non-black Muslims who were not off put by a conference centered around Black Muslims. In fact, the volunteers and panelist also reflected that diversity. One of the workshops, developed by Dr. Mona Masood, "Fair & Lovely non-Black Immigrant Muslims, Impact of Colonization and its Continued Legacy of Racism" seemed crafted directly for members in attendance from the Desi community. Dr. Masood focused on the development of anti-Black sentiments within the Desi community through religious and historical developments in India, immigration changes, Civil Rights and the challenging of White supremacy by the Nation of Islam. Masoods mention of the Hamitic Hypothesis (yes the same one Christians used to justify the enslavement of Africans/African Americans) piqued my interests particularly as it was also used by the British to subdue/conquer the Indians. Again, I found myself discussing this workshop with another friend, Maryam Abdelhamid and trying to unpack the complicated feelings and thoughts that swirled inside once it ended. Mostly though, I found myself basking in the excellence of Black Muslim Women from Kameelah, to Donna, to Su'ad, to Aamaal, to Aminah and all those in attendance doing amazing work. I literally stayed in one room for workshops all day as they dealt with issues that were dear to me. The first one, led by Aminah Bakeer asked us to write a Love Letter to a Black Muslim Woman that had inspired us. Then there was Aamal's workshop which asked us to consider the dangers that youth, especially Black Muslim youth face. She focused on why they are increasingly unmosqued and how the implementation of Rites of Passage programming can help stop and hopefully reverse the bleeding of our youth from their spiritual homes. This particularly spoke to me after my recent experience with Outward Bound...more on that later. Overall I left feeling very hopeful and inspired but also pumped for day two...and let me tell you....it did not disappoint. Ustadha Iesha Prime literally woke us up and silmultaneously tore the house down with her keynote speech which you can watch by clicking the link. That was followed by an enlightening and funny (in a way that only Quaiser Abdullah can do) introduction to the "Characteristics of the Emotionally Healthy, Self-Aware Community Leader". This session was aimed at setting the stage for the historic and sure to be fiery Imam RoundTable discussion. Foregoing a break after Dr. Abdullah's session, we got right to work with the roundtable. I will spare you all the details of what transpired inside the session, one because the organizers wanted it to be a safe space to share, and two because BMPC will be releasing more information in the months to come regarding this. What I will say is that I was extremely happy that so many Imams came to this forum and participated in it, even though they were very much put on the hot seat. The passion from their respective communities may have been uncomfortable and surprising BUT that is a result of the rarity of this sort of unfettered access to the leaders of our communities. In fact, the round table was so popular that it was extended into a second session after lunch. While I did not make it to the second part, I did share a very intimate, raw, and emotional moment with a few other sisters who needed to unpack after round 1. This to me was the moment where BMPC endeared itself to me forever. In that moment, I was so very grateful to have Kameelah and Donna who saw that more was needed and acted swiftly to ensure that no one left with wounds unaddressed. When I tell you this moment was so incredibly special, I mean it. So much so that I'm literally fighting back tears just replaying it in my head. I won't dwell on this, but if you want to know what sets this conference apart from all the others, it's the intrinsic ability to lay bare the wounds of what we experience as Black Muslim Americans and then offer ways in which to begin to heal. BMPC went out with a bang after the Imam roundtable by surprising Pioneers, Trailblazers, and Emerging leaders within the Black Muslim community with awards and a bean pie. A bean pie! Only at a Black Muslim Conference would this happen! The bean pie itself is historical in nature and highlights how integral Black Muslim Americans, in particular, the Nation of Islam has been to the development of American Islam. In fact, I'd argue, the Bean Pie is as American as Apple Pie and so to are Black Muslims. BMPC thank you for giving us a space that is so timely and necessary. I'm already looking forward to attending next year and I have a feeling this sentiment is shared by many others. Salaams Keziah.Thank you for this summary of the event. You definitely made me want to attend next year! Currently a student working on my licensce for MFT and Ph.D is there a newsletter that your organization has. Walaikum Salaam, please head to https://www.muslimwellness.com/ for more information on the Black Psychology conference and Muslim Wellness. They may have a newsletter but I am not sure.